What blepharitis symptoms and signs? How do health care professionals diagnose blepharitis? What are complications of blepharitis? What types of health care professionals treat blepharitis? What are medical treatment options for blepharitis? Are there home remedies for blepharitis? What is the prognosis for blepharitis? How long does blepharitis last? Is it possible to prevent blepharitis? Blepharitis is the term for eyelid inflammation. Signs and symptoms of blepharitis include red, irritated, itchy eyelids, along with the formation of dandruff-like scales at the base of the eyelashes and the eyelids. The cause of most cases of blepharitis is a malfunction of the oil glands of the lids, although allergies, eye infections, and systemic diseases can also cause blepharitis. In many cases, good eyelid hygiene and a regular cleaning routine can control blepharitis. In other instances, medications may be required. Blepharitis is the medical term for inflammation of the eyelids. The word "blepharitis" is derived from the Greek word blepharos, which means "eyelid," and the Greek suffix itis, which is typically used in English to denote an inflammation. Inflammation is the process by which white blood cells and the body's chemicals react to and protect us from foreign substances, injury, or infection. Signs of inflammation are eye swelling, redness, pain, warmth, and often change in function. Blepharitis is an inflammation of the eyelids, causing red, irritated, itchy eyelids and the formation of dandruff-like scales on the eyelashes. It is a common eye disorder with a wide variety of causes. It affects people of all ages. Although it may be uncomfortable, annoying, or unattractive, blepharitis is not contagious and does not cause permanent damage to eyesight. The skin condition can be difficult to manage and it tends to recur. Another term for blepharitis is granulated eyelids. Angular blepharitis describes inflammation that primarily affects the outer corners of the eyelids. Most patients with blepharitis have it in both eyes. MGD, or meibomian gland disease, is often used as a synonym for blepharitis. The cause of most cases of blepharitis is a malfunction of the oil glands of the lids, although allergies, eye infections, and certain systemic diseases can also cause blepharitis. Common types include allergic blepharitis, seborrheic blepharitis, infectious blepharitis, and blepharitis associated with meibomian gland dysfunction (MGD). Blepharitis involves the eyelid margins, where the eyelashes grow and the openings of the tiny oil glands are located. There may be involvement of the skin adjacent to the outer edges of the eyelid margins and/or the inner edge of the eyelid that comes into contact with the eyeball secondary to the underlying disorder of the lid margins. 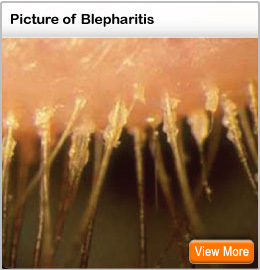 Most cases of blepharitis are posterior blepharitis, due to inflammation of the meibomian glands of the lids. There are about 40 of these glands in each of the upper and lower lids. The openings of each gland lie behind the eyelashes. The eyelid margins can become inflamed, irritated, and itchy when these glands produce abnormal secretions. Blepharitis is often seen in patients with acne rosacea, a common disorder of the oil glands of the skin of the face. Anterior blepharitis is due to inflammation of the lid margin around the lashes. Seborrheic blepharitis is similar to dandruff of the scalp and is a type of seborrheic dermatitis, a common skin condition that causes scaly patches, red skin, and stubborn dandruff. Seborrheic dermatitis can also affect oily areas of the body, such as the face, sides of the nose, eyebrows, ears, eyelids, and chest. Allergies due to reactions from mascara, contact lens solutions, sprays, exposure to animals, environmental chemicals, or airborne allergens can also cause blepharitis. Less commonly, inflammation of the lids can be caused by a primary infection of the eye lids by bacteria such as Staphylococci or infestation of the lashes by tiny mites (Demodex) or head lice. Since blepharitis is usually noninfectious, the vast majority of blepharitis cases are not contagious. dandruff (seborrhea) of the lashes and eyebrows. The symptoms and signs of blepharitis are often erroneously ascribed by the patient as being due to "recurrent conjunctivitis." They are also often mistakenly attributed to "dry eye" by patients due to the gritty sensation that may occur. Lubricating drops, however, do little to improve the condition. Blepharitis can be usually diagnosed by a physician based on the history as given by the patient and the physical examination. Taking a history includes a thorough discussion of symptoms that the patient is experiencing and a review of any general health problems that may be contributing to the eye problem. The physical examination concentrates on an evaluation of the eyelids, lid margins, base of the lashes, oil gland openings, tear quantity and quality, and the front surface of the eyeball using a slit lamp, which allows a magnified view with sufficient illumination. The type of blepharitis is determined based on this examination and appropriate treatment recommended. Occasionally, cultures are taken by swabbing the discharge and sending this to the laboratory. In some cases, an allergy evaluation may be required. It is unusual for blepharitis to cause serious medical problems. However, blepharitis can lead to the following changes in eye health. Sty: A sty (sometimes spelled stye) or hordeolum is a bacterial infection in one of the oil glands whose opening is clogged. The result is a painful lump on the edge or inside of the eyelid. Chalazion: A chalazion or conjunctival granuloma occurs when blockage in one or more of the oil glands causes it/them to become enlarged and scarred. Multiple chalazia can also develop, either on the same eyelid or on different lids. Chronic pinkeye: Blepharitis can lead to recurrent bouts of pinkeye (conjunctivitis). Ulceration of the cornea: Constant irritation from inflamed eyelids or misdirected eyelashes may cause a sore (ulcer) to develop on the cornea. Blepharitis does not affect vision generally, although disturbances of the tear film may intermittently blur vision, causing varying amounts of fluctuating vision during the day. If you develop blepharitis, you should be examined promptly by a health care professional trained in the diagnosis and treatment of eye disease. Such eye doctors include ophthalmologists and optometrists. Soften lid margin debris and oils: Apply a warm, wet compress to the lids, such as a washcloth with hot water, for five to 10 minutes two to four times a day. To keep the compresses warm for a longer period of time, place a small hot water bottle over the compress. Using a clean washcloth for each cleansing is important. Mechanically remove lid margin debris: After using the compresses, clean the eyelids with a cotton applicator stick soaked in a 4 to 1 mixture of water and baby shampoo or an over-the-counter lid-cleansing product. Gently and repeatedly rub along the lid margins while the eyes are closed. Be careful to avoid rubbing or scratching the eyes. Limit or stop using eye makeup, as its use will make lid hygiene more difficult. If one wears contact lenses, temporarily discontinuing wearing them during treatment may be advised. Other treatment depends on the specific type of blepharitis. The key to treating most types of blepharitis is keeping the lids clean and free of crusts. Dandruff shampoo is a standard recommendation. Antibiotics such as doxycycline, tetracycline, azithromycin, or erythromycin may be prescribed topically or orally. If the blepharitis is due to allergy, efforts should be made to identify and reduce exposure to the offending agent. Prescription, over-the-counter drops, or oral antihistamines may be used. If it is caused by an allergy at home or at work, simply avoiding the allergen (for example, a dog or cat) may avoid future problems. Oral omega-3 fatty acids, pulsating thermal lid massage, and intense pulsed light treatment to the meibomian glands have also been effective in chronic or severe cases. Good hygiene (regular cleaning of the area) can control signs and symptoms of blepharitis and prevent complications. Good eyelid care is usually sufficient for treatment. Such a routine needs to be convenient enough to be continued lifelong to avoid relapses, as blepharitis is often a chronic condition. One episode, however, does not signify that one has a lifelong condition. Blepharitis is not a vision-threatening condition. If blepharitis is linked to an underlying cause such as acne rosacea, treating those conditions may alleviate the blepharitis. In patients who have multiple episodes of blepharitis, the condition rarely disappears completely. Even with successful treatment, relapses are common. Taking the time to devote extra attention to good hygiene at those times may help to control the condition. Blepharitis due to allergies to mascara or other products like contact lens solutions, sprays, exposure to animals, environmental chemicals, or airborne allergens can be cured within a short period of time by removal of the inciting agent(s). More commonly, blepharitis is due to inflammation of the meibomian glands of the lids or the lid margin around the lashes. This type tends to be chronic, and if untreated, may persist for years, although the symptoms may be mild and variable. Appropriate daily treatment can lessen the signs and symptoms and can lead to remissions. It is not usually possible to prevent blepharitis. In many cases, good eyelid hygiene and a regular cleaning routine can control blepharitis. This includes frequent scalp and face washing, using a warm compress to soak the eyelids and doing eyelid scrubs using cotton swabs or other soft materials. Blepharitis is usually not contagious. Untreated blepharitis can last for many years, and chronic blepharitis can fluctuate in severity over time. Lemp, M.A., and K.K. Nichols. "Blepharitis in the United States 2009: a survey-based perspective on prevalence and treatment." The Ocular Surface (2009) 7:S1-S14. Lindsley, K., et al. "Interventions for chronic blepharitis." Cochrane Database of Systematic Reviews. May 16, 2012. Pflugfelder, Stephen C., et al. "Treatment of Blepharitis: Recent Clinical Trials." The Ocular Surface 12.4 (2014): 273-284. If known, what was the cause of your blepharitis? Please share the signs and symptoms associated with your blepharitis. What kinds of treatment, including hygiene, have helped your blepharitis? What is the prognosis for your blepharitis? Did you experience any blepharitis complications? Please describe how your blepharitis was diagnosed. Chalazions are cysts that form on the eyelid when a meibomian gland becomes inflamed. The meibomian glands secrete a mixture of oil and mucus (sebum) that lubricates the eye. When the gland becomes clogged, the material builds up and causes swelling.